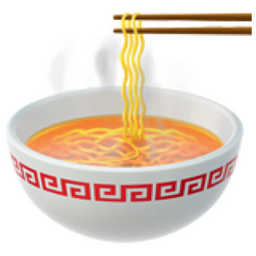 A bowl of hot ramen noodles or other noodle based soup, such as pho. Ramen noodles are a Japanese dish and pho is a Vietnamese dish. Broth can be either vegetable, chicken of fish based and can contain meat and other vegetables. Traditionally served with chopsticks and/or a short, wide and flat soup spoon.